Enjoying the reputation of "the big natural greenhouse" and cradle of the Wa people (wǎ zú 佤族), the city of Lincang (lín cāng 临沧) lies in the southwest of Yunnan, 50 kilometers north of the Tropic of Cancer. 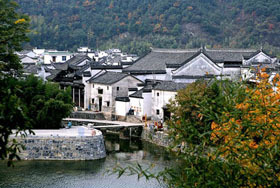 Lincang, so named because of the Lancang River (lán cāng jiāng 澜沧江) that flows nearby, has a land area of 24, 469 square kilometers. Proud of its gorgeous landscape, lovely climate, colorful cultures and customs of multiple nationalities, Lincang has become a very hot tourist destination in recent year and a most preferred city for studying the folk customs of the Wa people. The Western Han Dynasty (206BC-24AD) placed Lincang in the Yizhou shire after conquering the ancient Ailao (āi láo 哀牢) Kingdom. During the Tang (618-907) and Song (960-1279) dynasties, it belonged to the Nanzhao (nán zhào 南诏) and Dali (dà lǐ 大理) states respectively. Now, under its administration, there are one district, namely Linxiang District (lín xiáng qū 临翔区), four counties, namely Fengqing (fèng qìng xiàn 凤庆县), Yun (yún xiàn 云县), Yongde (yǒng dé xiàn 永德县), Zhenkang (zhèn kāng xiàn 镇康县), and three autonomous counties, namely Shuangjiang Lahu, Wa, Blang and Dai Autonomous County (shuāng jiāng lā hù zú wǎ zú bù lǎng zú dǎi zú zì zhì xiàn 双江拉祜族佤族布朗族傣族自治县), Gengma Dai and Wa Autonomous County (gěng mǎ dǎi zú wǎ zú zì zhì xiàn 耿马傣族佤族自治县), Cangyuan Wa Autonomous County (cāng yuán wǎ zú zì zhì xiàn 沧源佤族自治县). 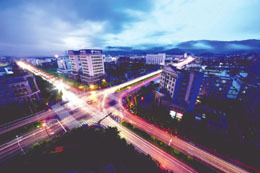 The whole city is part of the southern extension of the Hengduan Mountain Range (héng duàn shān mài 横断山脉) and in this territory there are two important mountain chains – Laobie (lǎo bié shān 老别山) and Bangma (bāng mǎ shān 邦马山). The central part of the city is higher and the land slopes from northeast to southwest. The average elevation is 1, 515 meters. The highest and lowest point are the Yongde Snow Mountain (yǒng dé xuě shān 永德雪山), which is 1, 505 meters above sea level, and the mouth of the Nanding River (nán tīng hé 南汀河) (450 meters) respectively. The Tropic of Cancer runs across the city and lends it a subtropical climate but which also combines with the cooler climate of the adjacent mountains. Generally a warm city, Lincang has an annual average temperature of 16.8-17.7°C (62.2-63.9°F). Lincang is known as the home of the Dianhong (diān hóng 滇红) Tea and one of the important habitats of the wild tea tree in the world. The locals have a history of more than 500 years of growing and drinking tea. Lincang boasts abundant tourist resources, i.e. minorities living customs, ancient architecture, historical relics, primitive villages, tea plantations and tea houses as well as gorgeous landscape marked by green peaks and clean water. 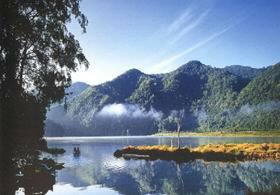 Coming to this charming land, you will be impressed by the harmony between the locals and the nature. The warm welcome and hospitality of the minority nationalities will also make your trip unforgettable. The 300 square kilometers snow mountain ranges, 24 kilometers in south - north direction and 15.6 kilometers in east–west direction, is a branch of the Biluo Snow Mountain (bì luó xuě shān 碧罗雪山). The main peak called Big Snow Mountain (dà xuě shān 大雪山) is 3, 429 meters high. To the northwest of the main peak is another peak called Small Snow Mountain (xiǎo xuě shān 小雪山) which is 3,177 meters high. To the south and east are the 2, 737 meters Honghua Peak (hóng huā shān 红花山) and 2, 843 meters Gudun Peak (gǔ dūn shān 鼓墩山). To the farthest east is the 1, 813 meters Dazhao Peak (dà zhāo shān 大朝山) which is already within the boundary of the Yun County. The zone above 3, 000 meters in elevation is frozen by snow and ice for at least three or four months each year. Tip: There is a public bus connecting the zone and Lincang City. One may also ride a taxi (about 300 Yuan) to cover this 100 kilometers distance. The cliff paintings of Cangyuan is said to take on different colors as the time, weather and humidity change. According to the proverb of the local Wa and Thai (dǎi 傣) people that the cliff painting changes three times a day: in the morning the color is red, at noon lighter and in the evening purple. Nowadays the paintings have already been designated as the key historical relic protection unit at the provincial level. Up to now, eleven painted cliffs have been found to scatter in several villages of Cangyuan County and Dima County etc. Called Randianmu (rǎn diǎn mǔ 染典姆) which means the paintings on the rocks in the local Wa language, these reddish brown ancient paintings were basically drawn on the grey limestone at the elevation of about 1, 500 meters. Measuring somewhere between one to thirty square meters, these primitive masterpieces are normally two to ten meters above the ground and include the images of animals, architectures, trees, boats, heavenly bodies like the sun or the moon, mountains and many abstract symbols etc. Human figures and lively life scene are also the important themes of these artistic works on the sharp cliffs. The eyes, nose and other facial details of the human face are normally omitted; the painters instead paid more attention to the depiction of the human body and limbs. 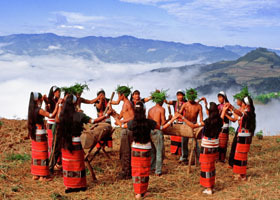 Apart from artistic meanings and value, many important life activities of these human ancestors such as hunting, dancing, recreation and sacrifice rituals and suchlike are vividly displayed and recorded, which seems to bring the viewers back to those mysterious and remote prehistoric ages. Tips: The tour of viewing the cliff painting is subject to the weather condition. Visitors who plan to see the painting should therefore consult the local travel agent about the timing of their visit in advance. Lincang is rich in rainfall and the rainy season comes from May until October. In the main hall of the DongJing Buddhist Temple (dòng jǐng fó sì 洞景佛寺), there are a gold statue of Sakyamuni and 22 statues of the Laughing Budda (Mile Buddha or Buddha of the future). This temple is particularly notable in southeastern Asian countries because it is home to the Buddha relic of Sakyamuni. According to the archeological record, after Sakyamuni passed away and was cremated, his bone, called “sarīra” in Sanskrit, was divided into eight shares, which were distributed across the region. The Buddha’s holy relic or sarīra was believed to bear the Buddha’s supreme power and thus be able to save all the lives on the earth. One of the eight shares was buried and worshiped in this temple. When the restoration of the temple was launched in 1994, 69 Buddha statues and a large quantity of jewelry, bronze statues and small pagodas were found in the site. Among the unearthed two pieces of bronze inscriptions mention the historical event of burying the Buddha’s holy bone here. One piece of 3 cm long transparent finger-like crystal is the holy bone, the discovery of which makes the temple more mysterious, holy and attractive to Buddhist followers from all over the world. Location: Mengding Town, Gengma County. Transportation: take regular bus from Gengma to Mengding. As the home of Yunnan black tea, the area has the largest tea garden and the greatest tea output in Yunnan. Its has more than 5,500 mu ancient tea plants and has done for over 3,200 years. Lingcang Tea Culture and Customs Garden (lín cāng chá wén huà fēng qíng yuán 临沧茶文化风情园) is the perfect stage to demonstrate the profound cultural connotations of tea, tea drinking and tea-related folk songs specific to the area. Lying in the suburb of the Linxiang District, the 110 hectare scenic zone is one of the 25 most heated tourist destinations of Yunnan Province. It is an all-around man-made tourist zone for sightseeing, leisure, recreation and cultural exploration. Wandering in the tea garden, one can not only learn the far - reaching Chinese Tea culture and tradition but also take part in the whole process of preparing tea. In the mean time one will be exposed to the colorful folk customs of the local nationalities. The section of the Lancang River within the boundary of Lincang City is more than 200 kilometers in distance. On this 200-kilometer river course there built three big hydropower stations at the level of mega kilowatts - Manwan (màn wān 漫湾), Dachaoshan, and Xiaowan (xiǎo wān 小湾) (the hydropower station of highest elevation in Asia). The three man made wonders are important components of the imposing and fantastic Lancang River One Hundred Miles High Gorge Landscape of the Chang Lake. The Chang Lake, together with numerous small peninsulas and isles on it, is truly tranquil and pretty. Around the pearl-like lake stand a number of green peaks varied in shapes and height. And the woods among the peaks on the lake bank are habitat of many rare wild species. Along the course of the Lancang River, many scenic spots are worth our mentioning; they are the Lancang River Big Canyon, Cloud and Sea Mountainous Villa, Manghuai (máng huái 忙怀) Neolithic relics, Zhaoshan Temple (zhāo shān sì 朝山寺), the relics of the Dian- Burma Railway, villages of minority nationality and the imposing hydropower stations. These tourist attractions that fall in different categories allow Lincang to be a popular tourist destination for almost all purpose - industrial tour, historical and cultural research, exploration, leisure and holiday, sightseeing, ecological tour, aquatic recreation and folk customs discovery etc. Lincang airport, west of Boshang Township and 22.5 kilometers south of Lincang City, is a key port to connect Yunnan Province and southeastern and southern Asian counties. For the transport between the airport and the city center, travelers can take either the taxi or the airport shuttle bus whose schedule is subject to the arrival of Flights. For further information and service, please dialService hotline: 0883-2683188; Ticket booking: 0883-2131168; Complaint hotline: 0883-2683110. Lincang is a most convenient land port on the route from southwest China to Rangoon, capital city of Burma. Three counties of Lincang, i. e. Cangyuan, Dima and Zhengkang are connected with Burma and the total national border is 290.791 kilometers in length. Today there are three Grade II national ports and five highways in this city directly linked with those of Burma. From Qingshuihe of the national port of Mengding to the important Burman town of Nashu is only 187 kilometers, and to the second largest city in Burma - Mandele is 457 kilometers. From Kunming - the capital city of Yunnan to Rangoon–the capital city of Burma is 1,892 kilometers in mileage. Owing to its strategic location and gorgeous subtropical scene, Lincang is often called “the gold city on the national border”. All the eight counties in the prefecture are well linked by high grade highway, some of which are built under lots of very dangerous and difficult geographical condition. Therefore some of the highways can be viewed as a manmade landscape or miracle. At the guests bus station travelers can take luxurious sleeper long distance buses to such destinations as Kunming, Guangtong, Xiaguan (xià guān 下关), Xiangyun, Baoshan (bǎo shān 保山), Cangning, Jinghong (jǐng dōng 景东) and Fengqing etc. Ticket booking: 0883-2123227; Information: 0883-2150741. The modern public transportation system, which consists of a number of bus lines and taxi service, makes the travel within the city zone easy and pleasant. The airport shuttle bus station is in front of the Tower of China Construction Bank. Due to the local topography, the railway system is less developed. Consequently travelers normally prefer long distance bus or airplane to rail.